No addresses or postcodes for this one…A unique and exceptional retreat on this remote, ancient sheep farm on Iceland’s northern Troll Peninsula, nestled at the foot of the Skíðadalur glacier. Twin share of a cabin is £1725 per person. You have your own room and share the bathroom with one other. Transfer cost from Rekjavik/Akureyi to the venue by coach. All meals: breakfast buffet, lunch/packed lunch, snacks, 3 -course dinners/buffet. Vegetarian, vegan and special diets catered for. Insurance. – It is the responsibility of the guest to ensure they are covered by travel insurance which covers for cancellation, health etc. Please ensure you have adequate cover. The only thing which is constant in life…is change. We are continually riding the turbulent waves of life, the joy and the sadness, the movement and the stillness, the dark and the light. This is the yin and yang of life. Opposing yet complementary and supporting energies which infuse everthing we experience. So, as in life……also on the yoga mat. Sometimes we find steadiness and ease, and often we find shaky foundations and creaking joints. The joy of yoga is in taking the time to follow the path of ongoing discovery and learn how to be with what simply is! What better place to explore the essence of yin and yang in our practice, than in a place so different to our usual surroundings. Moring sessions will be geared to awaken us to some of the yang elements of our practice, creating heat and movement in the body. Late afternoon sessions will complement and balance our experience with practices which are more yin and also restorative in nature. Who will this retreat suit? 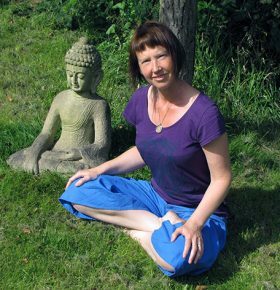 – This 5 day retreat is suitable for all levels. Complete beginners are very welcome to come along. All that is required is that you bring an open mind and a willingness to learn. For those with more experience in their practice, there will be an opportunity to re-visit basics with a new eye and use this to refresh and deepen practice… and learn more! Please note: The week is not suitable for people who are only interested in strong physical yoga as a variety of practices will be offered.